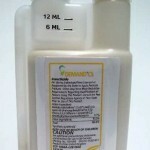 PRODUCT DESCRIPTION: White "milky" synthetic pyrethroid which works well for most any perimeter pest. 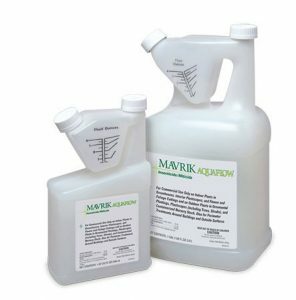 Water based, odorless, fast working and long lasting, Mavrik is a good option for both liquid and fogging applications when you need to control pests over a large area 1/4 acre or more. TARGET PESTS: Just about anything including but not limited to Aphids, Thrips, Mites, Clover Mites, Two-Spotted Spider Mites, Whiteflies, Mealybugs, Leaf-Feeding Caterpillars (i.e., Tent, Orlando, Gypsy Moth, Bagworm, CankerWorm, etc. ), Ticks, Brown Dog Ticks, American Dog Ticks, Lone Star Ticks, Deer Ticks, Fleas, Ants, Fire Ants, Crickets, Armyworms, Cutworms, Springtails (Collembola), Adelgids, Mosquitoes, Chiggers, Earwigs, Lygus Plant Bugs, Beetles (Flea, Cucumber, Elm Leaf), Leafhoppers, Weevils (Strawberry Root, Obscure Root, Blackvine Root), Psyllids, Millipedes and more. WHERE TO USE IT: Outside the home, on foundations, turf grass, shrubs, flowers, trees and more. RATE OF APPLICATION: Rates vary depending on the target pest and how you apply mixed solutions. For some pests, .1-.25 oz per gallon per 1,000 sq/ft will be adequate for maintenance. For initial cleanouts, .5 oz per gallon per 1,000 sq/ft should be used initially. When fogging or mist blowing, use 1 oz per gallon and plan on using 1-2 gallons of mixed solution per 1/2 acre.